Almost 60 years after he compiled one of the most remarkable leadership records of World War II, M. B. Etheredge has been presented the Texas Legislative Medal of Honor. Etheredge received the award Wednesday (July 30) from Gov. Rick Perry, who praised the wartime service and lifetime of citizenship of the 88-year-old Huntsville resident. The ceremony was held in the Texas Capitol, before his family, friends and service buddies. Asked if he would like to make any remarks, Etheredge said simply, "Thank you." "It was lovely," he said later. "First class. I apprecate all the honors I've had." A reception honoring Etheredge is scheduled for 5:30-7:30 p.m. Thursday (Aug. 7) at the HEARTS Veterans Museum in the West Hill Mall. The Texas Legislative Medal of Honor was established by the 58th Texas Legislature in 1963 to honor gallant and intrepid service by Texas soldiers. One of the few U. S. World War II soldiers to have received three Silver Star Medals, Etheredge also received two Bronze Stars and two Purple Hearts for battle wounds. He was actually wounded five times, but did not receive awards for the other three wounds because they were never recorded at aid stations during the fierce fighting. During the Wednesday ceremony the 78th Texas Legislature's resolution honoring Etheredge was read, including descriptions of his most outstanding leadership accomplishments. He was a member of the 3rd Infantry Division, which also produced another well-known war hero named Audie Murphy. On the night of March 12-13, 1944 north of Carano, Italy, Etheredge led a patrol that killed at least 10 Germans, captured 12, and knocked out two machine guns. On May 23, 1944, also in Italy, though wounded in the leg, he took charge of a company of the 30th Infantry Regiment after its other five officers were killed or wounded. He led an attack through steady fire and secured a position critical to the success of three other companies. This was during an Allied breakout from the Anzio beachhead, after five months of bloody fighting. He rose in rank from second lieutenant to captain in six days. When his company reached Rome 12 days after that second heroic action, it had fallen in numbers from 200 enlisted men to 35. Of its six officers, Etheredge was the only one left. His heroism was not finished, however. On August 16, in France, he ignored machine gun fire toward the tank destroyer from which he was firing, then led an assault that captured 29 enemy soldiers, an anti-tank gun, a mortar, and large quantities of ammunition. According to the official citations, he is credited with killing 10 and capturing 41 during those three actions that resulted in the award of his first Silver Star and an additional two oak leaf clusters. 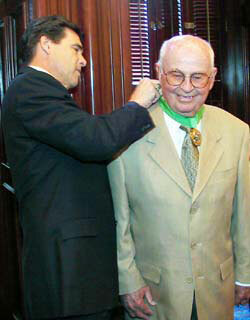 Murphy received the U. S. Medal of Honor for his heroism on January 26, 1945. His citation credited him with killing or wounding "about 50," and like Etheredge he did some of his best fighting while wounded, and from atop a tank destroyer. Etheredge was discharged with the highest efficiency rating of any officer in the Fourth Army. He and Murphy became good friends after the war, and Murphy requested to be assigned to Etheredge's Texas National Guard unit. Etheredge said that he once asked Murphy to wear his Medal of Honor because the men of the unit wanted to see it. Murphy said he would rather not, because "those ribbons irritate the hell out of you." Etheredge suggested to their commander, a general, that he ask Murphy to wear the medal. "I will," Murphy told the general. "But would you tell Colonel Etheredge to wear his ribbons too." Audie Murphy went to Hollywood and became a movie star. 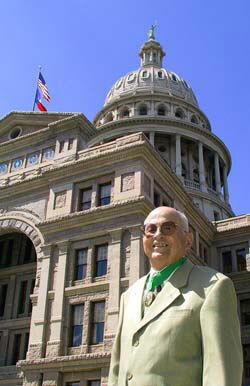 M. B. Etheredge stayed in Texas for a lifetime of public service and business accomplishment. A 1937 graduate of Sam Houston State Teachers College, who had served as a teacher and principal before volunteering to fight in 1942, he returned to receive his master's degree at Sam Houston State in 1947. He has been inducted into the Lettermen Association Hall of Honor and in 1982 was presented the Distinguished Alumni Award. He also served three terms in the Texas Legislature, taught 33 years at Sam Houston State, and became a successful banker and land developer. While in the Legislature, he was chairman of the House Education Committee, and it was with his leadership that the Gilmer-Aiken Bills that reorganized the Texas public education system were passed. Also present at Wednesday's ceremony were representatives Dan Ellis and Lois Kolkhorst, who sponsored House Concurrent Resolution 27, that was unanimously adopted by the House on May 6 and the Senate on May 28.